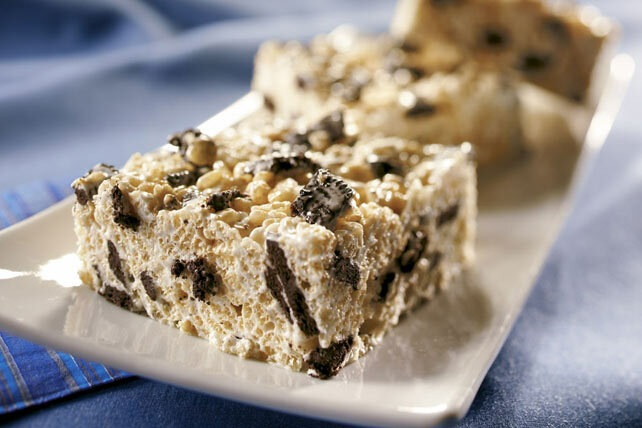 Everyone loves marshmallow crispy treats, but we've taken them one step further. With the addition of chopped OREO Cookies, what's not to love? Add cereal and 1 cup chopped cookies; mix well. Press onto bottom of 13x9-inch pan sprayed with cooking spray. Sprinkle with remaining chopped cookies; press lightly into cereal mixture to secure. Cool completely before cutting into bars. Store these crispy treats in a tightly sealed container for up to 3 days.